Every six months or so, I have had the pleasure and the honour of playing in Sala Manuel M. Ponce in the Palacio de Bellas Artes, Mexico City’s Citadel of Culture. Last year, after my concert Brubeck/Bolling in INBA’s Jazz Festival, Jaime Ruiz Lobera, National Coordinator of Music, invited me to give a concert with INBA Concertista Carlos Salmerón of music by Haydn, Hummel and Beethoven in November and I wondered how I could share it with my colleagues. 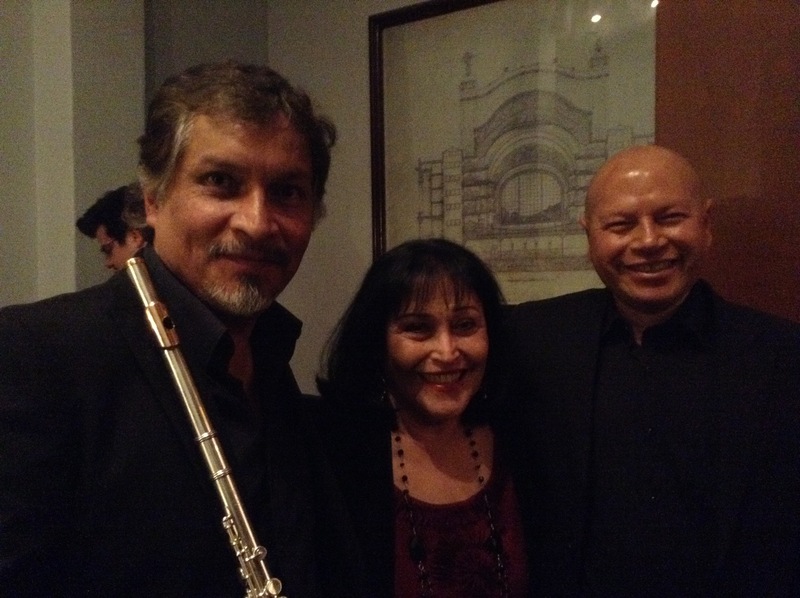 From his germ of an idea came a monthly season of concerts by some of the leading flute player in Mexico, many of whom had never been heard in the Palacio de Bellas Artes. We have had three concerts so far – all with full houses – and on 19 March we look forward hearing there Principal flute of the Orquesta Filarmónica de Jalisco Antonio Dubatovka presenting an all-Russian program as the fourth of the series. The second concert, on 5 December, was a fascinating concert devoted to the music of Gerhard Münch given by Guillermo Portillo, Principal Flute of the Michoacan Symphony, together with Jairo Ortiz, cello and Heriberto Cruz, piano. It is not often that we are treated to an exceptional concert of music by this distinguished German-born composer who spent such a large part of his life living in Mexico. The concert was supported by the University of Michoacan. Cuauhtémoc Trejo, Principal Flute of the Guanajuato Orchestra (OSUG) gave the third concert with Concertisa de Bellas Artes, Armando Merino; an outstanding concert of music by Bach, Donizetti, Beethoven and Dvorak. I have known Cuauhtémoc since he was a student and was proud that he and Armando gave such an outstanding performance. On 19 March, the Russian flute player Antonio Dubatovka playing with the American pianist Timothy Ruff Welch will offer a program devotes to works from his home-land including Sonatas by Takaschivili and Prokopviev as wells a Romance by Antonio’s teacher at the Moscow Conservatoire,Yuri Doljikov, whom I had the pleasure of knowing. Mtro Doljikov was one of the great flute teachers and he would be proud to know how well his pupil is playing today. Future concerts will be give by the gifted Mexican Yamani Fuentes, Principal Flute of the Queretaro Philharmonic (2 April) with harpist Mara Tamayo; American Megan Maiorana, Principal Flute of the Aguascalientes Orchestra who presents a fascinating program with her Trio Luminary (21 May) ; and on 5 June, the Principal Flute of the Yucatan Orchestra, Colombian flautist Joaquin Melo will give a French recital with his pianist Irene Decheva. If you haven’t yet heard this outstanding duo you should not miss the opportunity! Finally, on 7 July I will return with my colleagues pianist Carlos Salmerón and cellist Adolfo Ramos playing two great Trios: the Weber Trio in G Minor for flute, cello and piano and, probably for the first time ever in Mexico, Mendelssohn’s own transcription of his great D Minor Trio in a new edition of András Adorn. It has been a dream to invite these friends and colleagues to be heard on a major stage in the Palacio de Bellas Artes. They are regularly heard in their own cities across the Republic and now audiences in Mexico can hear what marvellous music-making is going on all over the Republic. Both Michael and I, as well as our colleagues from INBA and the excellent staff of the Palacio de Bellas Artes look forward to giving you a great welcome to these concerts! Next PostLife on the Road!